Do You Remember... "Iron Horse". 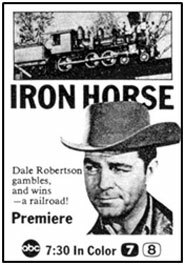 Dale Robertson’s “Iron Horse” began as “Scalplock”, a Columbia Pictures made-for-television movie which aired on April 10, 1966. Robertson played dapper frontier gambler Benjamin P. Calhoun who won the Buffalo Pass, Scalplock and Defiance Railroad in a high stakes poker game in Kansas City. The problem, which set up the premise for the series, was that the railroad line he won was only partially built, 130 miles were needed to finish the connection to the Union Pacific, and the line was “broke…penniless,” owing some $500,000. Nevertheless, the flamboyant, self assured Calhoun, realizing the future of the West depended on the railroad, quickly acquired a competitor’s palacious private car, La Bonne Chance, and through faith, bluff, nerve and pure luck finagled his work crew into accepting stock in the BPS&D rather than back pay and rounded up a crew to help him finish the line: construction engineer Dave Tarrant (Gary Collins) (originally played by Todd Armstrong in the “Scalplock” movie pilot); former telegraph office worker Barnabas Rogers (Bob Random) as an engineer (with his pet raccoon Ulysses); and Swedish giant Nils Torvald (6' 6" Roger Torrey) as head of the construction gang. “Iron Horse” depicted the dedicated and determined Ben Calhoun’s problems in completing the line…obtaining right-of-ways, Indians, outlaws, freight contracts, workmen, lack of capital and much more. Two seasons, 47 one hour color episodes were aired on ABC, the first season (30 eps.) on Monday night from 7:30-8:30. 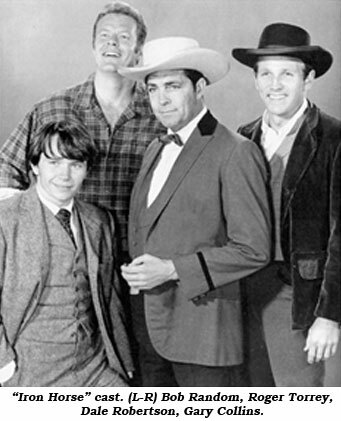 But the network competition was tough on “Iron Horse” with the popular “Gilligan’s Island” and “Run Buddy Run” on CBS and “The Monkees” and “I Dream of Jeannie” on NBC. 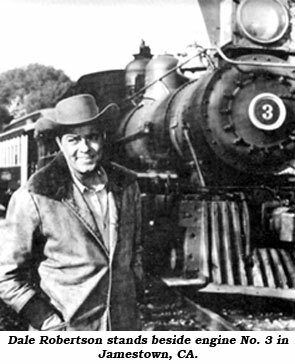 Lackadaisical ratings saw ABC move Robertson’s “Iron Horse” to Saturday night as of season two (beginning Sept. 16, ‘67) from 9:30-10:30pm, but again with a movie on NBC and “Petticoat Junction” and the 1st half of “Mannix” on CBS, the end of track was in sight for “Iron Horse” on January 6, ‘68. Oklahoma born Dale Robertson, 89, died February 27, 2013, near San Diego, CA. Gary Collins (born 1938) went on to guest on hundreds of TV shows, but scant few Westerns. He died at 74 in Biloxi, MS, on October 13, 2012. Canadian Bob Random (born 1943) worked sporadically until 1990 and is now retired in British Columbia, Canada. Pocatello, ID, born Roger Torrey died of a brain hemorrhage at 47 in 1985.